Most people agree that the relation between world wars and childhood is a key point to investigate. For this reason, we are more than happy to give evidence to an extremely interesting multidisciplinary conference that will take place in the coming week, from 10th to 12th May. 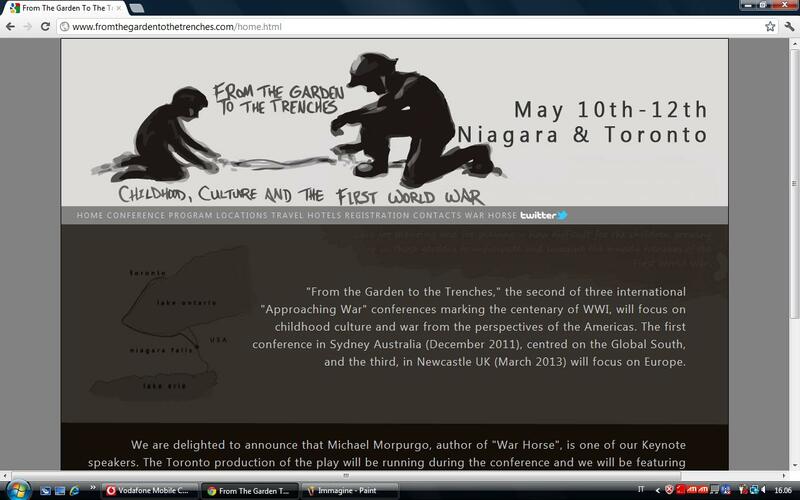 The title is From the Garden to the Trenches and the locations will be in Niagara and Toronto. This is the second of a three symposium series organized by the research project "Approaching war: childhood, culture and the first world war" (see this website). This second conference follows the one hosted in Sydney, Australia (December 2011) and centred on the Global South. It will focus on childhood, culture and war, but from the perspectives of the Americas. A third conference, to be hosted in Newcastle UK (March 2013), will complete the precious mapping work considering the european context. Full program and more information available here.